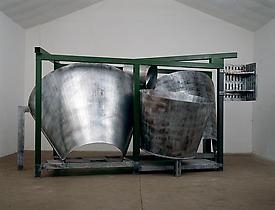 Annely Juda Fine Art will be presenting the first exhibition of a series of new galvanized sculptures by Sir Anthony Caro. The exhibition will take place over two floors at Annely Juda Fine Art including the recently expanded third floor gallery space. It has been organized in collaboration with Mitchell-Innes & Nash's exhibition in the Chelsea gallery, from October 19 to November 21, 2007.